Now on vinyl!!! 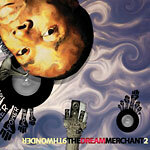 Over the last several months we've seen an onslaught of 9th Wonder singles and exclusives, wondering which projects or albums they'd appear on, finally Dream Merchant volume 2 collects not just many of the tracks from these latest releases, but all new material as well! The super producer's resume continues to grow with an impressive list of collabs and credits to his name, and it can only keep expanding as he receives praise from hip hop artists and fans across the boards. Say what you will about him, whether you think he's more hype than heart or not, there's a certain glimmer to his production, a throwback to the mid to late 90's of that underground sound you just don't get very often anymore.